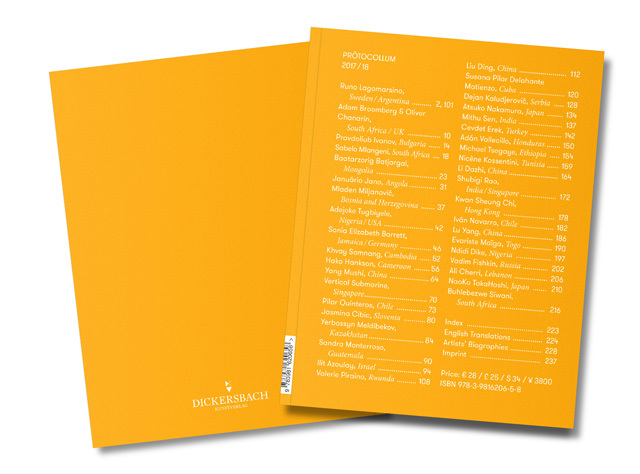 The fifth issue of PRŌTOCOLLUM, the annually published anthology dedicated to non-Western contemporary visual artists, art narratives and art history, has been released by DICKERSBACH KUNSTVERLAG. PRŌTOCOLLUM’s issue for 2018/19 features contributions by 21 visual artists and art collectives from 22 countries. Next to its focus on non-Western positions in contemporary art, PRŌTOCOLLUM champions artistic autonomy over editorial sovereignty in order to provide authentic encounters with the presented practices. All contributing artists are invited to independently choose and create their content for PRŌTOCOLLUM without editorial supervision or intervention. This intentional restraint on behalf of the editorial team ensures that no intermediary stands between the artist and the reader. Expert comment and third party evaluation only take place if the artists choose to include such texts with their respective contributions. To further strengthen regional views and perspectives, PRŌTOCOLLUM has developed its own concept of peer review, by inviting contributors of previous issues to recommend notable artists from their regions. Being able to tap into the knowledge and expertise of such a diverse artistic community puts this journal in a unique position as a platform for non-Western contemporary visual art. Its motto ‘Global Perspectives on Visual Vocabulary’ furthermore epitomizes the intention to present a visual arts exhibition in the framework of an art journal, letting the visual flow rather than editorial criteria determine the sequence of the artists’ contributions and layout — undisturbed and uninterrupted by commercial ads or sponsored content. 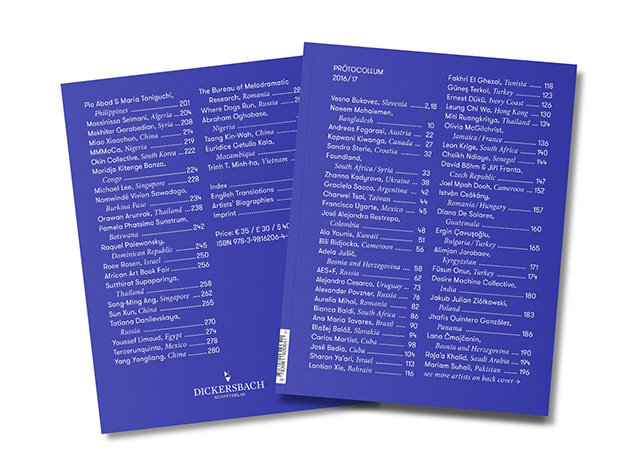 Since the inaugural issue, which appeared in October 2014, around 325 artists and artist collectives from over 105 countries have participated in PRŌTOCOLLUM. The 2018/2019 edition once more brings together emerging talents and established artists from across Eastern Europe, Africa, the Middle East, Latin America and Asia, lending prominence to art scenes and developments otherwise un­der-represented in the Western art circuit. A must-have for collectors and professionals interested in a cross-section of contemporary visual art on a truly global scale. 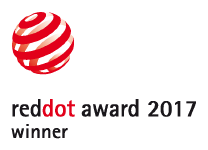 PRŌTOCOLLUM has also been presented with a "Special Mention" of the German Design Award 2019, a prize that is awarded by the German Design Council to pioneering contributions to the German and international design landscape. Languages: English (Portions in Chinese, French, Portuguese, Spanish). 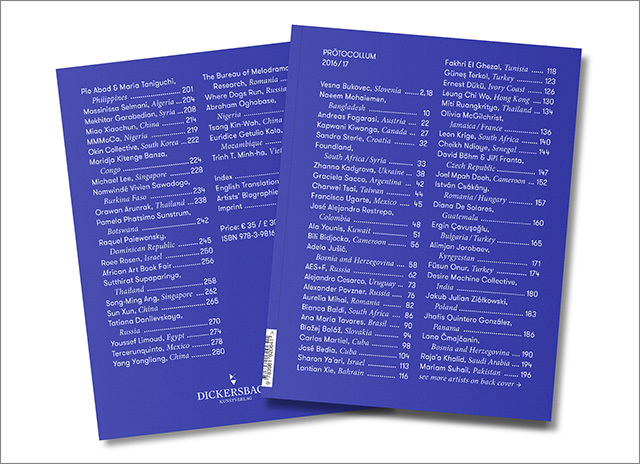 The fourth issue of PRŌTOCOLLUM, the annually published anthology dedicated to non-Western contemporary visual artists, art narratives and art history, has been released by DICKERSBACH KUNSTVERLAG. PRŌTOCOLLUM’s issue for 2017/18 features contributions by 39 visual artists and art collectives from 34 countries. Since the inaugural issue, which appeared in October 2014, around 300 artists and artist collectives from almost 100 countries have participated in PRŌTOCOLLUM. The 2017/2018 edition once more brings together emerging talents and established artists from across Eastern Europe, Africa, the Middle East, Latin America and Asia, lending prominence to art scenes and developments otherwise under-represented in the Western art circuit. A must-have for collectors and professionals interested in a cross-section of contemporary visual art on a truly global scale. 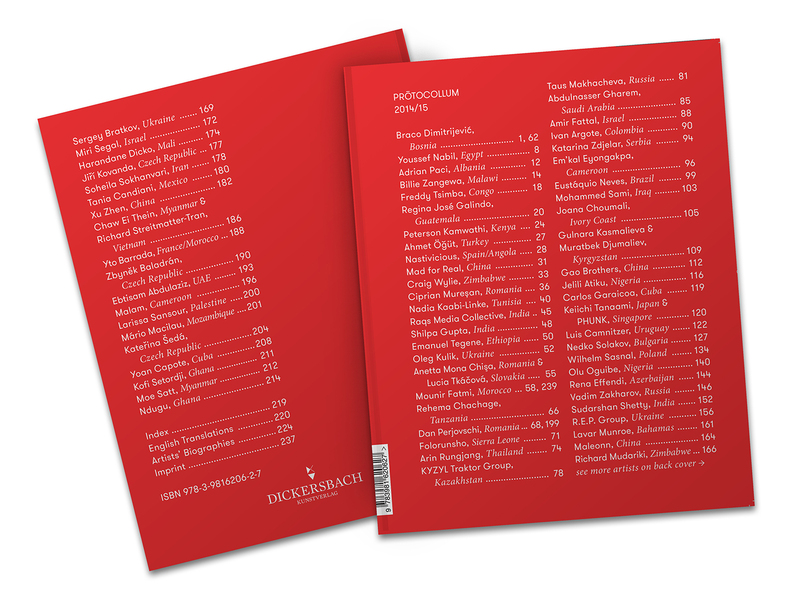 The third issue of PRŌTOCOLLUM, an annually published anthology dedicated to non-Western contemporary visual artists, art narratives and art history, has been released by DICKERSBACH KUNSTVERLAG. PRŌTOCOLLUM’s issue for 2016/17 features contributions by 76 visual artists and art collectives from 50 countries across Eastern Europe, Africa, the Middle East, Latin America and Asia. PRŌTOCOLLUM deliberately invites artists to decide independently about the contents of their contributions, without any interference or filtration, curatorial analysis or critical evaluation through editorial or art historical hierarchies. The artists’ contributions are presented to the journal’s readership in an unmediated way and based on the artists’ personal decisions and perspectives. 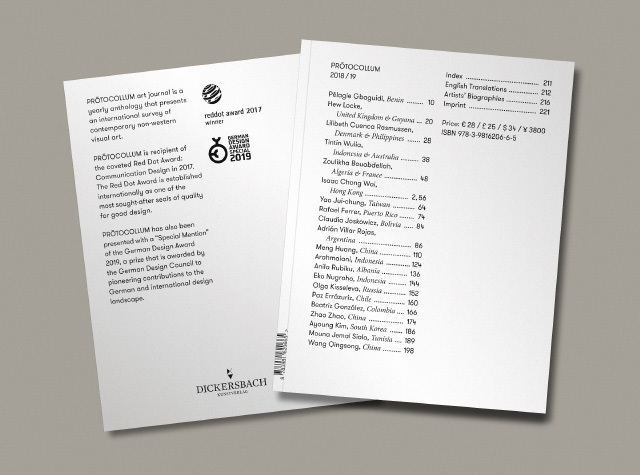 The weight given to the artists’ authorship on the pages of PRŌTOCOLLUM and the restrictions on editorial interventions are also expressed by the fact that the cover of PRŌTOCOLLUM does not depict any specific artworks and does not highlight any single artist, but instead lists all contributing artists to the respective issue of the journal as equally significant. To further strengthen regional views and perspectives, PRŌTOCOLLUM 2016/17 continues to develop its concept of peer review, by inviting contributors of previous issues to recommend interesting artists from their regions. In the three issues published so far more than 230 artists and artist collectives from 94 countries have participated in PRŌTOCOLLUM. Being able to tap into the knowledge and expertise of this diverse community puts this journal in a unique position as a platform for non-Western contemporary visual art whose motto Global Perspectives on Visual Vocabulary epitomizes the intention to present a visual arts exhibition in the framework of an art journal, letting the visual flow rather than an alphabetical order determine the sequence of the artists’ contributions, undisturbed and uninterrupted by commercial ads or sponsored content that the journal strives to go without. Languages: English (Portions in French, Spanish, Turkish and Russian). Contributing artists are: Pio Abad & Maria Taniguchi (Philippines), AES+F (Russia), African Art Book Fair, Song-Ming Ang (Singapore), Orawan Arunrak (Thailand), Blažej Baláž (Slovakia), Bianca Baldi (South Africa), Moridja Kitenge Banza (Congo), José Bedia (Cuba), Bili Bidjocka (Cameroon), David Böhm & Jiří Franta (Czech Republic), Vesna Bukovec (Slovenia), Ergin Çavuşoğlu (Bulgaria/Turkey), Alejandro Cesarco (Uruguay), Leung Chi Wo (Hong Kong), Lana Čmajčanin (Bosnia and Herzegovina), István Csákány (Romania/Hungary), Tatiana Danilevskaya (Russia), Diana de Solares (Guatemala), Desire Machine Collective (India), Ernest Dükü (Ivory Coast), Fakhri El Ghezal (Tunisia), Andreas Fogarasi (Austria), Foundland (South Africa/Syria), Mekhitar Garabedian (Syria), Euridice Getulio Kala (Mozambique), Alimjan Jorobaev (Kyrgyzstan), Adela Jušić (Bosnia and Herzegovina), Zhanna Kadyrova (Ukraine), Raja'a Khalid (Saudi-Arabia), Tsang Kin-Wah (Hong Kong), Kapwani Kiwanga (Canada), Leon Krige (South Africa), Michael Lee (Singapore), Youssef Limoud (Egypt), Carlos Martiel (Cuba), Olivia McGilchrist (Jamaica/France), Aurelia Mihai (Romania), Trinh T. Minh-ha (Vietnam), MMMoCa (Nigeria), Naeem Mohaiemen (Bangladesh), Joel Mpah Dooh (Cameroon), Cheikh Ndiaye (Senegal), Abraham Oghobase (Nigeria), Okin Collective (South Korea), Füsun Onur (Turkey), Raquel Paiewonsky (Dominican Republic), Pamela Phatsimo Sunstrum (Botswana), Alexander Povzner (Russia), Jhafis Quintero González (Panama), José Alejandro Restrepo (Colombia), Roee Rosen (Israel), Miti Ruangkritya (Thailand), Graciela Sacco (Argentina), Nomwindé Vivien Sawadogo (Burkina Faso), Massinissa Selmani (Algeria), Sandra Sterle (Croatia), Mariam Suhail (Pakistan), Sutthirat Supaparinya (Thailand), Ana Maria Tavares (Brazil), Tercerunquinto (Mexico), Güneş Terkol (Turkey), The Bureau of Melodramatic Research (Romania), Charwei Tsai (Taiwan), Francisco Ugarte (Mexico), Where Dogs Run (Russia), Miao Xiaochun (China), Lantian Xie (Bahrain), Sun Xun (China), Sharon Ya’ari (Israel), Yang Yongliang (China), Ala Younis (Kuwait), Jakub Julian Ziółkowski (Poland). Berlin-based DICKERSBACH KUNSTVERLAG presents the second issue of PRŌTOCOLLUM, an annually published artists’ journal dedicated to non-Western contemporary visual artists, art narratives and art history. 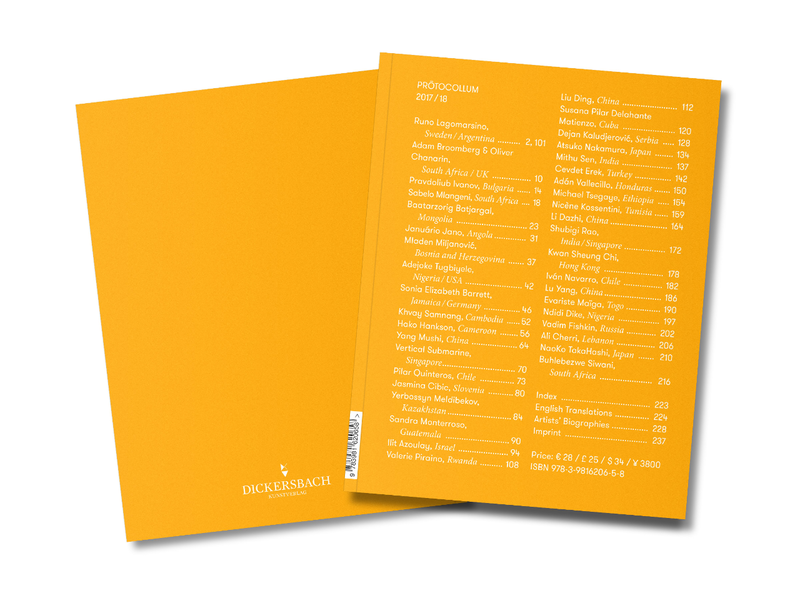 Honouring its motto Global Perspectives on Visual Vocabulary, PRŌTOCOLLUM’s issue for 2015/16 features contributions by 92 visual artists and art collectives from 53 countries across Eastern Europe, Africa, the Middle East, Latin America and Asia. PRŌTOCOLLUM dedicates itself to the participating artists’ thoughts, visions and ideas, and offers its readership an unfiltered and unmediated encounter with contemporary global artistic practice. The artists independently select the content they would like to have published in their respective sections and are free to determine their contributions and the way in which they would like to communicate with the journal’s readers, including their language of preference. PRŌTOCOLLUM does not want to reflect what art experts, critics and curators think. The concept follows a strict philosophy of artistic autonomy over editorial authority, with no adverts and no editorial or curatorial interference. For 2015/16 PRŌTOCOLLUM has invited a selection of artists from the inaugural issue to propose contributors, thus ensuring that the perspectives of local art scenes are duly represented. Featuring visual artists, art collectives and artistic practices across a wide range of media on more than 350 pages, the journal’s 2nd issue once more provides unique access to truly global contemporary art production. Languages: English (Portions in French, Chinese, Spanish, Romanian). Contributing artists are: Basel Abbas & Ruanne Abou-Rahme (Palestine), Vyacheslav Akhunov (Uzbekistan), Karo Akpokiere (Nigeria), Ammar Al-Beik (Syria), Yuri Albert (Russia), Halil Altindere (Turkey), Jude Anogwih (Nigeria), Alexander Apóstol (Venezuela), Luis Cruz Azaceta (Cuba), Cheikhou Bâ (Senegal), Fayçal Baghriche (Algeria), Ali Banisadr (Iran), Jean-Pierre Bekolo (Cameroon), Anca Benera & Arnold Estefan (Romania), Irina Botea (Romania), Luis Camnitzer (Uruguay), Nidhal Chamekh (Tunisia), Chen Chieh-jen (Taiwan), Chto Delat (Russia), Tiffany Chung (Vietnam), Carlos Cruz-Diez (Venezuela), Blue Curry (Bahamas), Danica Dakić (Bos­nia), Gohar Dashti (Iran), Jose Dávila (Mexico), Gilles Elie-Dit-Cosaque (France), Patricia Esquivias (Venezuela), Etcetera (Argentina/Chile), İnci Eviner (Turkey), Rita Fischer (Uruguay), Fokus Grupa (Croatia), Jeanno Gaussi (Afghanistan), Kendell Geers (South Africa), Gil & Moti (Israel), Marina Gržinić & Aina Šmid (Slovenia), Rula Halawani (Palestine), Hoang Duong Cam (Vietnam), HowDoYouSayYaminAfrican?, IRWIN Group (Slovenia), Délio Jasse (Angola), Hiwa K (Iraq), Šejla Kamerić (Bos­nia), Krištof Kintera (Czech Republic), Barbora Kleinhamplová (Czech Republic), Katarzyna Kozyra (Po­land), Wiz Kudowor (Ghana), Nedim Kufi (Iraq), Miriam Syowia Kyambi (Kenya), Lee Yongbaek (Korea), Zbigniew Libera (Poland), Lucía Madriz (Costa Rica), MAP Office (Morocco/France), Misheck Masamvu (Zim­babwe), Vincent Michéa (France/Senegal), Ivan Moudov (Bulgaria), Lada Nakonechna (Ukraine), Moataz Nasr (Egypt), Aimé Ntakiyica (Burundi), Mahmoud Obaidi (Iraq), OPAVIVARÁ! (Brazil), Open Group (Ukraine), Luis González Palma (Guatemala), Jorge Pardo (Cuba), Pratchaya Phinthong (Thailand), Cameron Platter (South Africa), Shahpour Pouyan (Iran), Ana Prvački (Serbia), Pors & Rao (India/Denmark), Mykola Ridnyi (Ukraine), Luciana Rondolini (Argentina), Steve Sabella (Palestine), Georges Senga (Congo), Sheng Qi (China), Regina Silveira (Brazil), Dimitar Solakov (Bulgaria), Sun Yuan & Peng Yu (China), Teppei Kaneuji (Japan), Barthélémy Toguo (Cam­eroon), Tromarama (Indonesia), Rodrigo Valenzuela (Chile), Mona Vatamanu & Florin Tudor (Romania/Switzerland), Ryszard Waśko (Poland), Pavel Wolberg (Russia), Nil Yalter (Turkey), Héctor Zamora (Mexico), Arseny Zhilyaev (Russia). PRŌTOCOLLUM, the new and innovative artists' journal by DICKERSBACH KUNSTVERLAG, presents an international survey of contemporary non-Western artists, art narratives and art history. Honouring its motto 'Global Perspectives on Visual Vocabulary', PRŌTOCOLLUM's inaugural issue features contributions by 72 visual artists and art collectives from 54 countries across Eastern Europe, Africa, the Middle East, Latin America and Asia. As an anthology of contemporary visual art PRŌTOCOLLUM will appear once a year. 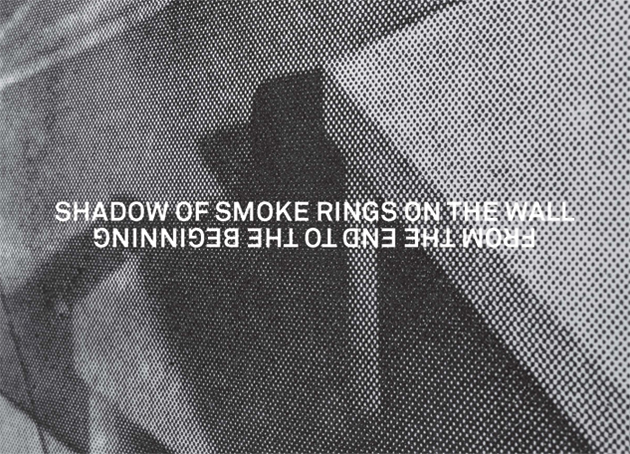 PRŌTOCOLLUM re-defines the role of art magazines and art journals. Instead of dictating the journal's contents from an editorial perspective, the invited artists independently select the content they would like to be published and positioned in their respective sections of the journal. PRŌTOCOLLUM does not want to reflect what art experts, critics and curators think, but rather to let the artists choose for themselves what they want to publish and how they want to communicate with the reader, in an unmitigated fashion. Contributing artists are: Ebtisam Abdulaziz (U.A.E. ), Ivan Argote (Colombia), Jelili Atiku (Nigeria), Zbyněk Baladrán (Czech Republic), Yto Barrada (France/Morocco), Sergey Bratkov (Ukraine), Luis Camnitzer (Uruguay), Tania Candiani (Mexico), Yoan Capote (Cuba), Rehema Chachage (Tanzania), Anetta Mona Chişa (Romania), Joana Choumali (Ivory Coast), Harandane Dicko (Mali), Braco Dimitrijević (Bosnia), Muratbek Djumaliev (Kyrgyzstan), Rena Effendi (Azerbaijan), Em'kal Eyongakpa (Cameroon), Mounir Fatmi (Morocco), Amir Fattal (Israel), Folorunsho (Sierra Leone), Regina José Galindo (Guatemala), Gao Brothers (China), Carlos Garaicoa (Cuba), Abdulnasser Gharem (Saudi Arabia), Shilpa Gupta (India), Nadia Kaabi-Linke (Tunisia), Peterson Kamwathi (Kenya), Gulnara Kasmalieva (Kyrgyzstan), Jiří Kovanda (Czech Republic), Oleg Kulik (Ukraine), KYZYL Traktor Group (Kazakhstan), Mário Macilau (Mozambique), Mad for Real (China), Taus Makhacheva (Russia), Malam (Cameroon), Maleonn (China), Richard Mudariki (Zimbabwe), Lavar Munroe (Bahamas), Ciprian Mureşan (Romania), Youssef Nabil (Egypt), Nastivicious (Spain/Angola), Ndugu (Ghana), Eustáquio Neves (Brazil), Olu Oguibe, Ahmet Öğüt (Turkey), Adrian Paci (Albania), Dan Perjovschi (Romania), PHUNK (Singapore), Raqs Media Collective (India), R.E.P. Group (Ukraine), Arin Rungjang (Thailand), Mohammed Sami (Iraq), Larissa Sansour (Palestine), Wilhelm Sasnal (Poland), Moe Satt (Myanmar), Kateřina Šedá (Czech Republic), Miri Segal (Israel), Kofi Setordji (Ghana), Sudarshan Shetty (India), Soheila Sokhanvari (Iran), Nedko Solakov (Bulgaria), Richard Streitmatter-Tran (Vietnam), Keiichi Tanaami (Japan), Emanuel Tegene (Ethiopia), Chaw Ei Thein (Myanmar), Lucia Tkáčová (Slovakia), Freddy Tsimba (Congo), Craig Wylie (Zimbabwe), Vadim Zakharov (Russia), Billie Zangewa (Malawi), Katarina Zdjelar (Serbia), Xu Zhen (China). "WE LIKE BOOKS AND WE ARE ALSO MADLY IN LOVE WITH ART!" 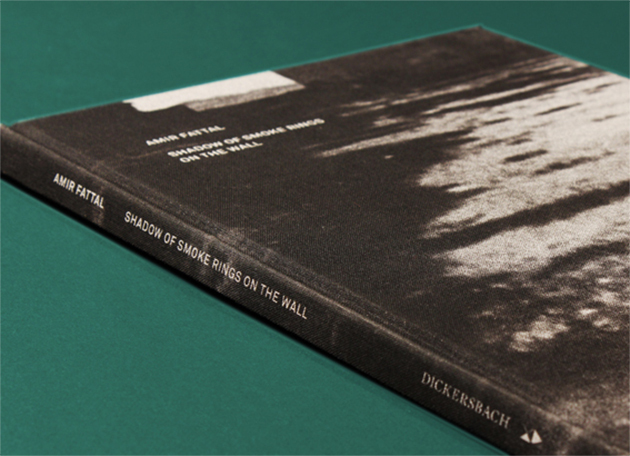 Berlin based DICKERSBACH KUNSTVERLAG is a publishing house specialising in high quality books, monographs and artist catalogues by selected artists from countries outside of the traditional sphere of Western art history. It focuses on contemporary culture and pursues a goal of building communicative bridges between different cultures and artistic traditions. One of the publisher’s central themes is to address the Eurocentric and Western dominance in defining the criteria of which contemporary art is considered relevant. 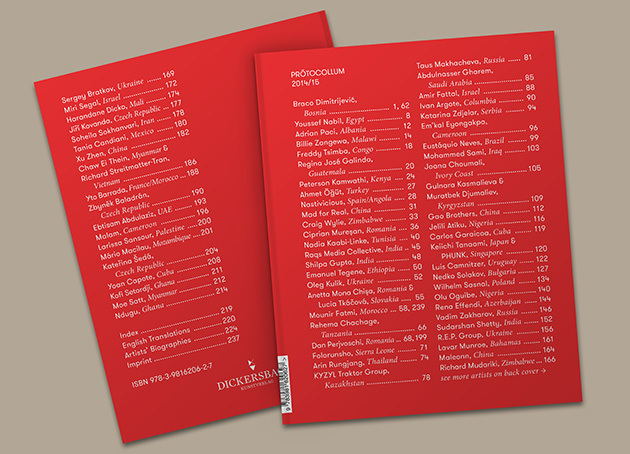 DICKERSBACH KUNSTVERLAG encourages publications that contribute new ideas and perspectives in contemporary culture and artistic expression, and provides a forum for the documentation of art history and artistic narratives from places of the world that are often ignored or marginalised by Western art institutions and art experts who nevertheless claim to present an international programme. The aim of this publishing platform is to reflect the full diversity of global artistic practice. PRŌTOCOLLUM "Global Perspectives on Visual Vocabulary"
The new artists' journal PRŌTOCOLLUM published by Berlin based DICKERSBACH KUNSTVERLAG presents an international survey of contemporary non-Western art, art narratives and art history and features contributions by 72 artists and art collectives from 54 countries across Eastern Europe, Africa, the Middle East, Latin America and Asia in its inaugural issue. Book launch of a monograph about the works of Amir Fattal. Published by DICKERSBACH KUNSTVERLAG with essays by Dr. Heinz Stahlhut, Ludwig Seyfarth and Nimrod Reitman. With the kind support of Kulturverwaltung des Berliner Senats. Première of Amir Fattal’s new work based on ‘Liebestod’ from Richard Wagner’s opera “Tristan und Isolde”. Performed by the Zafraan Ensemble. Conducted by Holly Mathieson. Soprano: Dénise Beck. ‘From the End to the Beginning’ (duration approx. 12 min) will be performed twice: once at 7pm and once at 8pm. "Global Perspectives on Visual Vocabulary"